The government’s special adviser on poverty has denounced both the Conservatives and Labour for failing to clearly outline their planned austerity agenda to voters in the run-up to the general election. Speaking to the Independent on Monday, Chair of the Commission on Social Mobility and Child Poverty Alan Milburn warned all parties have a “responsibility” to be honest with prospective voters about the likely societal impact of their proposed cuts. “If you have been through a period of economic turbulence and the books are still not balanced, the challenge for all the political parties is to prove they have both the competence and the plans to deliver. Detail here may not be the politicians’ friend, but it is the voters’ friend,” he said. Milburn argued leading politicians in Britain are risking an “inter-generational war” by preserving perks for gilded pensioners while weakening state support for young working adults. He said both Labour and the Conservatives remain entrenched in their “comfort zones” and are currently appealing to their core voters with tired and predictable policy proposals relating to the economy and the National Health Service (NHS). His sharp criticism coincides with the Institute for Fiscal Studies’ (IFS) call for both parties to be more transparent about their tax and spending plans post May 7. The think tank also dismissed Prime Minister David Cameron’s suggestion that a Labour government would increase taxes by over £3,000 (US$4,440) for the average working household over the next five years. Speaking to the Independent, Milburn suggested the Conservative Party must come clean on the details of its proposed £12 billion in welfare cuts. A series of options compiled by the Department for Work and Pensions, leaked to the BBC last week, include a regional benefits cap and the taxing of disability benefits. Nevertheless, ministers argue that firm decisions are yet to be made. He said the election is currently polarizing into a dual-pronged debate regarding the economy and the NHS. Millburn said he would like to know exactly where each party is placing its bets. He stressed at present parties’ spending and tax plans remain shrouded in secrecy. The IFS was also critical of both parties’ fiscal plans, warning the British public are largely in the dark about what precise economic path Chancellor George Osborne and Labour Shadow Chancellor Ed Balls would take following the election. The think tank said there is “real uncertainty” regarding Labour’s economic policy proposals, while the Conservatives have been somewhat clearer in outlining what they hope to achieve. The IFS also hit out at Cameron for his £3,028 Labour “tax bombshell” claim. “There is little value in bandying around numbers which suggest that either party would increase taxes by an average of £3,000 for each working household,” it said. During his interview with the Independent, Milburn said political parties in Britain are guilty of “political expediency.” He argued retaining free TV licenses and bus passes for well-off pensioners might score political points, but it would also further impact on British society. The Milburn added Britain now has a more serious problem with low paid work than unemployment. He predicted that Conservative proposals to freeze benefits for those of working age would impact heavily upon low-paid workers and reduce people’s incentive to work. Milburn dismissed Labour leader Ed Miliband’s claim that Britain has shifted somewhat to the left, claiming the state’s political landscape is not dissimilar to that which existed when ex-Labour PM Tony Blair won a landslide victory in the 1997 general election. “Elections are won in the center,” he said. The first poll to be published in the wake of the general election campaign kickoff revealed the Tories hold a marginal two-point lead over the Labour Party. 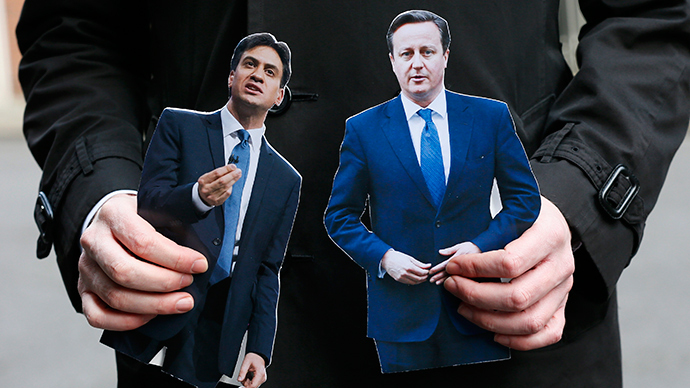 However, it suggested Miliband is closing in on Cameron. Conservative peer Lord Ashcroft’s most recent survey indicated the Tories had 36 percent of the vote, while Labour stood at 34 percent. The Liberal Democrats shed two points standing at 6 percent, while UKIP suffered a similar fall to ten percent. The Green Party moved ahead of the Liberal Democrats, up two points to 7 percent. Meanwhile, Scotland’s SNP lagged behind at 4 percent. Follow RT’s general election coverage with the hashtag #PeopleNotPolls.